Over the last few years Android games have significantly improved in quality and graphics. However, it’s the improvement in gameplay that has led to people coming back to play more. 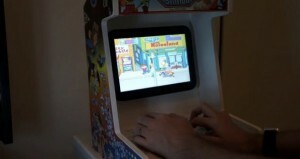 It’s easy to turn any Android tablet into an old style arcade machine. Understandably some of the most popular games are the classic arcade games which can be played using emulators. Even though the graphics are not particularly impressive, some of the gameplay is still unrivaled and of course nostalgia is also involved. One gamer has decided to take things a step further and built his own Android arcade machine. At first glance his arcade machine looks like any other old-school machine found in amusement centres. However, a closer look reveals that Pac Man, After Burner, TMNT, Mortal Kombat and a number of other games are all being played on a Lenovo K1 tablet. The joystick is a Wii Tatsunoki Vs Capcom stick and is wirelessly configured to work with the tablet via Bluetooth. The combination of the tablet and the joystick are all that is necessary for a realistic arcade machine experience. There are now a few videos on YouTube demonstrating how to construct one of these machines. If you’re a fan of old arcade games then be sure to check it out, they’re cheap to make and provide hours of fun.